In our last tutorial, we understood how to configure a collection of objects stored within a List collection using Spring Framework. In this tutorial, we are going to explain how to configure a collection of objects stored within a Set collection using the <set> tag of Spring Framework within its configuration XML file. We are going to create a java class named Company within the decodejava package and this class contains a String property named name and a Set collection to contain Employee objects. Besides this, we are also going to define a couple of getter and setter methods within this class to set the Set collection and the String property. Creates a Set collection of three Employee beans and initiate it with a value by calling its setter methods i.e. setName() and setTelNo() for each of these Employee beans. This Set collection collection of Employee beans is injected into Company bean. Eventually, using the bean of Company class, this class calls the method of Employee class - getName() and getTelNo(). The <set> child tag element in <property> tag is used to configure a Set collection property of Employee type in Company class. 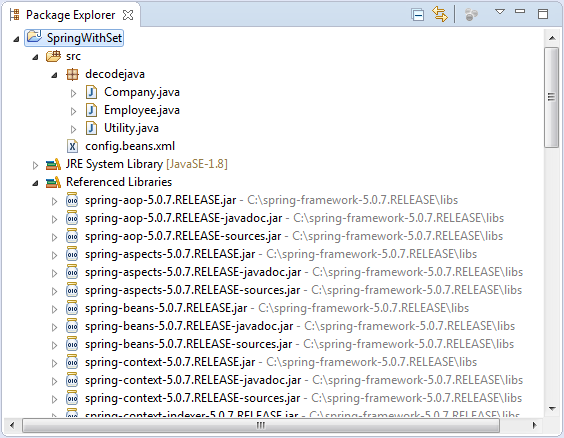 Project Folder - SpringWithSet is the name of our Project and it is a top-level directory. Another POJO class named Employee.java class. This concludes configuring a Set collection with the Spring Framework. In the next article, we are going to show you how to configure a Map collection with the Spring Framework.